IMPORTANT NOTICE: IF YOU ARE IN MYANMAR (BURMA), SHARING THIS ARTICLE ON SOCIAL MEDIA COULD RESULT IN ARREST. If you live in Myanmar (Burma), please consider carefully before sharing this article on social media such as Facebook. Sharing this article could result in arrest under section 66(d) of the Telecommunications Law. From a constitutional standpoint, Myanmar, also known as Burma, has been through a series of transformations throughout its history. While there is much to be optimistic about in the coming years, it would, however, be a mistake to characterize Myanmar as a fully functioning democracy at this stage. Despite this fact, Aung San Suu Kyi, Myanmar’s State Counsellor and de facto leader, has come under heavy criticism from her fellow Nobel Peace Prize laureates and the international community for failing to speak out forcefully against the human rights violations occurring in Rakhine State. To be clear, Suu Kyi’s response to the issue has, at times, been perplexing. That being said, while the human rights abuses being perpetrated against the Rohingya Muslims are serious and should not be diminished, the criticism leveled at Suu Kyi fails to completely appreciate the political and constitutional tensions that exist in Myanmar. Before outlining the current state of constitutional affairs, it is important to briefly outline how far the Southeast Asian nation has come. This will go a long way in demonstrating just how fragile the current political climate actually is. This is not the first time the Burmese people have experienced democracy, before having it ripped from their grasp by a military all too willing to ignore the rule of law. Faced with volatile elements such as these and permanent constitutional barriers conveniently implemented by the former military junta, democratic gains will only be maintained and enhanced through incremental steps towards constitutional reform. During the Second World War, after more than a century of British control, a small group of Burmese men led by Aung San, the Father of Burma’s independence from Britain, went to Japan to receive military training. This training allowed them to overthrow British rule with the help of the Japanese. When it became clear that Japan was intent on controlling Burma as Britain had done, Aung San sought to negotiate a military intervention with British authorities – all with the goal of obtaining real independence for Burma. Following the war, Aung San and other Burmese nationalists made clear to British Prime Minister Clement Attlee that they would not accept dominion status. Only complete independence was acceptable. This included transitioning to a democratic state built on federal principles where ethnic and religious minorities had a place at the table. The Panglong Conference of 1947, a gathering of ethnic minority leaders and the Bamar majority represented by Aung San, stands as the gold-standard for cooperation in Myanmar. This is where the seeds of ethnic compromise were forged. The product of this Conference and Burma’s constituent assembly was the 1947 Constitution – a rich document that even provided individual states with a right of secession (see sections 201-206 of the 1947 Constitution). On this road to independence, Aung San was tragically assassinated in July of 1947, along with a number of his proposed cabinet members. Despite the loss of their revered leader, the Burmese people continued their march towards independence under the leadership of U Nu, a close friend of the late General Aung San. Between 1948-1958 and 1960-1962, Myanmar did experience democratic governance. It was an emerging parliamentary democracy at the time. Both periods ended with a military coup. The first coup, in 1958, was a sign of things to come. The military approached Prime Minister U Nu and proposed a coup to maintain the integrity of the Union in the face of political divisions. Rather than allow an illegal coup to take place, U Nu agreed to pass legislation that permitted the military to govern for a short period. They ended up keeping power for less than two years, before setting the stage for the 1960 elections in which U Nu was overwhelmingly re-elected. The second coup, in 1962, was also premised on the preservation of the Union. Essentially, in the military’s view, a country built on federal principles was a threat to the integrity of the Burmese state. They wanted to ensure that their country would never be completely disintegrated by minority secession, as provided by the Constitution. Military rule led to decades of repression. It was not until 1988 that the military’s monopoly on power began to be seriously questioned. In the wake of pro-democracy uprisings that were followed by military crackdowns, Aung San Suu Kyi, the only daughter of Aung San, was caught up in the opposition to the military regime and became involved with the National League for Democracy (the “NLD”) – a political party wedded to the cause of freedom and self-determination for the Burmese people. She ultimately became its leader. For the crime of attempting to discontinue military rule and undermining its legitimacy by peaceful means, she was sentenced to house arrest on-and-off until 2010. Others suffered a worse fate – human rights abuses, torture and death being the norm. Suu Kyi’s struggle to bring democracy to her country has not been easy. In the face of democratic uprisings in the 1980s, the military regime had agreed to hold multi-party democratic elections in 1990. While Suu Kyi was not allowed to personally campaign given that she was under house arrest, her party shockingly won about 80% of the seats in the election. Despite expectations that the NLD would govern the Southeast Asian state as the duly elected representatives of the people, the military ultimately decided to maintain its grip on power. There was no peaceful transition of power. After decades of sanctions from the international community, Myanmar undertook steps to transition to “democracy.” In 2008, a draft constitution was put to the Burmese people in a referendum. The document put forward by the military managed to preserve their place in the country’s governance, while also creating a “fourth branch” of government for themselves. As is often the case in authoritarian regimes, there was widespread intimidation of voters, which resulted in over 90% approval. Faced with an illegitimate Constitution and election laws which barred anyone with a criminal record from participating in the elections, the NLD decided to boycott the 2010 general election. 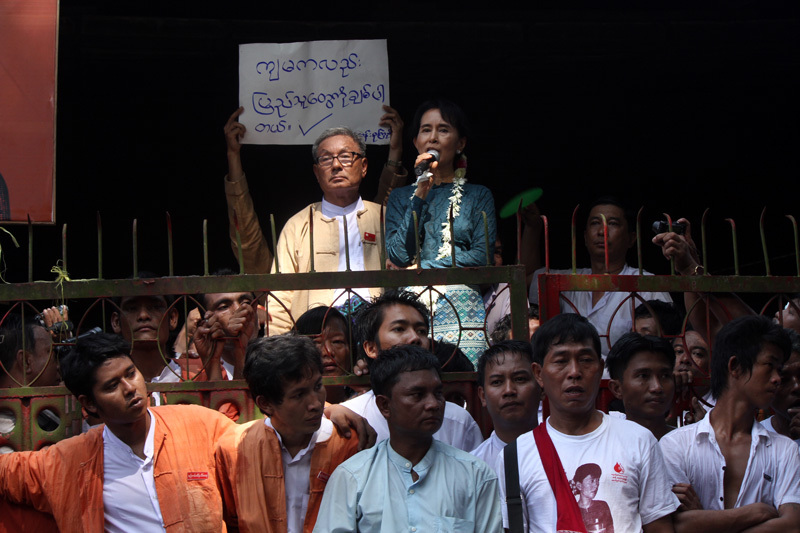 Since most pro-democracy activists, including Suu Kyi, faced criminal charges after the 1988 uprisings, they were effectively barred from seeking election under the applicable legislation. Ultimately, the military-backed Union Solidarity and Development Party won an overwhelming majority of seats in the central legislature and Thein Sein, a former general, became the President. Suu Kyi was only released from house arrest following the general election. After years of hard work, Suu Kyi’s party ran in the 2015 general election and won a landslide victory, taking 58% of the seats in the House of Representatives and 60% of the seats in the House of Nationalities. The NLD’s support is broad, ranging from urban to rural communities and from Bamar majority areas to ethnic minority areas. Riding a wave of change and optimism, expectations were naturally quite high. These expectations must be tempered by two important factors: (1) real democracy does not spring up overnight; and (2) constitutional limitations are currently an impediment to creating a fully functioning democratic state. In an interview in April, Suu Kyi emphasized the practical changes that have already begun under her watch: constructing all-weather roads and providing electrification. These, and other structural economic reforms proposed by the NLD, will ultimately lead to an increase in economic development and provide a better standard of living for her people. It bears reminding that Myanmar is currently one of the poorest countries in Southeast Asia, with approximately 26% of its people living in poverty. These economic transformations are therefore important and will have a long-lasting impact. Reversing the effects of decades of crippling economic sanctions is a top priority on the ground. On the political and constitutional front, Suu Kyi has also furthered the peace process in a country that has historically been divided by ethnic and religious conflicts. As of August 2016, she has convened the 21st century Panglong Conference, which has met twice so far and has as its end-goal to amend Myanmar’s 2008 Constitution to adopt a truly federal Constitution. This Conference takes its name from the previously-mentioned similar gathering that occurred as Burma was obtaining its independence from Britain. While the process is not perfect, the spirit of that time is in the air and ethnic reconciliation is on the agenda. Despite these gains and important changes, it would be naïve to believe that Myanmar has become an ideal democratic state. The NLD is currently stuck in Myanmar’s constitutional straitjacket. The transition from military dictatorship to democratic republic has not been a clean break. The 2008 Constitution still provides an important and imposing role for the military in national and local affairs. The military is constitutionally guaranteed 25 percent of seats in the national, state and regional legislatures (see sections 109 and 141 of the 2008 Constitution). These members are chosen by the Commander-in-Chief, currently Senior General Min Aung Hlaing, of the Myanmar armed forces (also called the Tatmadaw). This means the NLD, and other political parties, still have to deal with the military on a regular basis as members of the legislative branch. More importantly, the military has a constitutionally protected number of seats in the executive branch. Three of the most important ministries are afforded to military members nominated by the Commander-in-Chief: defence, home affairs and border affairs (see section 232 of the Constitution). To cap things off, any amendments to the current Constitution must be approved by over 75 percent of the members in both houses of the central legislature. This effectively requires at least one military vote (see section 436 of the Constitution). In that sense, the military, who held Suu Kyi captive for years, continues to have a significant role in governing the Southeast Asian state. Added to the significant hurdles outlined above, it is important to note that the President of the Union of Myanmar, Htin Kyaw, is not the Commander-in-Chief of the military. Generally speaking, the head of state and the Commander-in-Chief of a democratic country are the same person. Civilian control of the military is seen as a fundamental aspect of democratic governance. This is not so in Myanmar. The military continues to have complete control of its own affairs (see section 20 of the Constitution). In that sense, a parallel system of governance operates – one that has not been subjected to the same criticism as Suu Kyi. Some seem to believe that, in her capacity as State Counsellor, she has an impact on military matters. To believe this is to completely misunderstand the current state of affairs in Myanmar. Its constitutional architecture is not limited to the three traditional branches of government. The Constitution specifically provides that military matters are to be left to the military. Suu Kyi is therefore left in an odd position: advancing change where possible, while wrestling with the very real constitutional constraints imposed on her. This is why the decades-long struggle of democrats, like Suu Kyi and those who lost their lives in the pro-democracy uprisings to free their country from the chains of authoritarianism, is not over. Much work remains to be done to amend the current Constitution so as to transform Myanmar into a truly federal democratic republic. In the interim, Suu Kyi and those around her seem to have recognized that pragmatism is the key to achieving their end-goal. In a recent visit to Myanmar, the activists I spoke with expressed a similar sentiment. Democracy and federalism will only succeed by taking incremental steps towards progress and undergoing the difficult task of constitutional amendment through the proper channels. This requires cooperating with the military in some way. Any sudden move could lead to a refusal to amend the Constitution, or another military coup, thus invalidating all the progress that has been achieved so far. History shows us that this is a real possibility. Would Myanmar be better off if Suu Kyi adopted an antagonistic attitude towards the military at this point? I suggest that it would not be in the best interest of her people to do so. Instead, the international community must recognize the delicate situation faced by the NLD and stand shoulder-to-shoulder with them, and others wedded to the cause of democracy, in advocating for further constitutional change. Let’s blame the actual perpetrators of the crimes occurring in Rakhine State: the military and its Commander-in-Chief, Senior General Min Aung Hlaing. Their behaviour should be criticized and condemned. In addition, limiting their role in national and local institutions and striving towards civilian control of the military are all efforts the international community can surely get behind. These things will not happen overnight. It will take time and effort to achieve them – something the NLD and their supporters clearly understand. It’s time international criticism of Aung San Suu Kyi reflected this local reality. Jesse Hartery is a law student at McGill University. He holds a B.A. (Honours) in History and a Minor in Asian Studies.